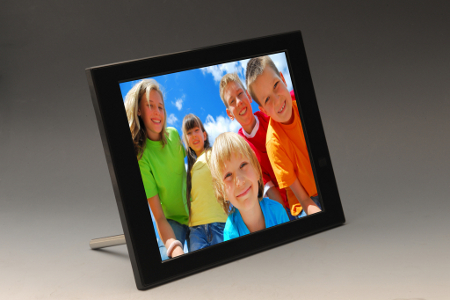 Pix-Star is back with a spanking new digital picture frame for the masses, and just before you ask where were you all this while as you never heard of the name “Pix-Star” before, bear in mind that they pioneered the concept of “the frame with an email address”. They’re back with a spanking new model, which is the Pix-Star FotoConnect HD (PXT510WR02) – being the latest member of the Pix-Star FotoConnect family. It will sport a relatively large high-resolution 10.4″ LED LCD display with a 4:3 ratio, so forget about watching those widescreen movies on this. This particular model will sport an 800 x 600 resolution, and as mentioned, the 4:3 aspect ratio isn’t good for movies, but it is perfect for digital camera photos – which was what it was created for in the first place anyways. The FotoConnect HD has been slapped with a $189 price tag, where it is touted to deliver more features compared to its rivals in the market at the same price bracket. Using Wi-Fi connectivity, it is able to access the Internet – and for good reason, too, as it has an e-mail address of for itself so you can always snap a photo and e-mail to it directly without having to go through a computer. To sweeten the deal, the e-mail address hosting is free – without any monthly fee to budget as well. Pix-Star is also proud to announce that this is the only Wi-Fi frame that sports a built-in email filter and spam blocker, preventing unsolicited pictures (from the mistress, in particular) to be sent to this family oriented digital picture frame. The Pix-Star will also be able to access online albums from over 20 providers directly – among them include Picasa, Facebook, Smugmug, Shutterfly, FlickR, and MobileMe amongst others. It is also the first of its kind to support UPnP-DLNA, letting you display photos from a Mac, PC or compatible NAS server (UPnP) without the need to go through the hassle of an image transfer, now how about that?